Jenny Chandler, author of the superb recipe book Pulse, created this recipe for Hodmedod's British-grown split yellow peas. 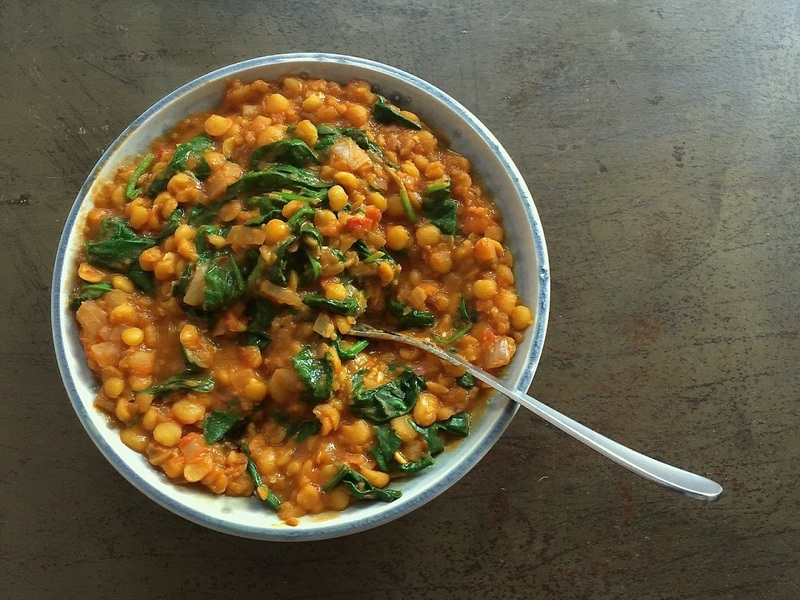 Dal Saag - Split Yellow Pea And Spinach Dal- A variant on classic chana dal, this can be served as part of an Indian feast or eaten for a comforting simple supper with some flatbread or rice. Soaking the peas for a few hours will speed up the cooking but they do only take about 45 minutes to cook from scratch. Rinse the split peas in a sieve, place in a large saucepan with the turmeric and cover with about 1 litre of cold water. Bring the pan up to the boil and then cover and simmer for about 30 minutes to an hour until the peas are quite soft and creamy. You may need to add more water as the peas cook; I like my dal to have quite a thick texture and some discernible peas whilst others prefer a soupier creamy finish. Whilst the peas are cooking you can fry up the spiced tomato mixture in a small frying pan. Heat up the oil and fry off the whole cumin seeds until fragrant. Add the onion, chilli and ginger and cook for about 10 minutes until the onion begins to soften. Turn up the heat and stir in the garlic, coriander and garam masala, cooking just until you are enveloped in all the wonderful smells. Add the tomatoes and simmer for a couple of minutes. Once the split peas are soft and cooked through you can add the tomato mixture, along with a pinch of salt, and continue to cook for about 5 minutes. Throw in the spinach at the last moment, it barely requires any cooking at all, just a couple of minutes in the hot dal will wilt it beautifully. Kale or Swiss chard are also great options and take about 5 minutes to cook in the dal over a medium heat. You could add chopped fresh coriander or a pinch of amchur powder (dried sour mango) just before serving. Serve hot with plain rice or flat bread. What do you think of this Dal Saag recipe?